Curious about the the first human romantic places in the world? Just come to Saudi Arabia. 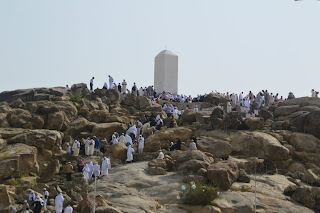 There was a hill called Jabal Rahmah, where the couple first met at the Earth, Adam and Eve. This hill is usually used as a place to pray for the singles. Saudi Arabia can not be eliminated from the history of human development. Muslims believe, is where humans first met the Prophet Adam and Eve, after falling from heaven, precisely in the Jabal Rahmah, Arafat. A hill Jabal Rahmah meaning of love, because it has brought together two men who had been separated for a little over 100 years old. 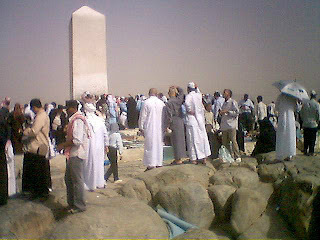 Here, you can see a proof in the desert with a high obelisk on top. This hill is always crowded with tourists, whether they're umrah or hajj. To reach the top, you have to prepare physically strong as it is quite tiring to climb stairs. Typically, visitors are willing to tire-tired to climb the ladder are those of the single. The goal is to write his name on the memorial wall. By writing the name in there, they hope to be reunited with a mate, like Adam and Eve. In fact, not far from the hill, there is a board containing instructions regarding the prohibition to scribble on a rock on this mountain. In the courts of Jabal Rahmah, you can also see many artisans selling souvenirs typical Arab. Most of them sell beads, rings, bracelets and various. Be careful with the seller here, because the price offered is far more expensive than the price in the market or a kiosk. Here, your bargaining prowess tested. If a visit to Jabal Rahmah, you not only get to go up into the hills and buy souvenirs, but also riding a camel. Ready to ride camels decorated as beautiful as possible. A chair is decorated like your ready to sit on the throne. If you come with your spouse, both must be riding a camel is very romantic. Do not forget memorialized with a photo.